Several MEA member art teachers and their high school students blended artistic talents with ideas related to financial literacy, a topic not usually associated with beautiful visual imagery, in a contest hosted by Oakland County Treasurer Andy Meisner. The Michigan Department of Education (MDE) is phasing out 12 teaching endorsements in subjects that are hard to fill or do not attract enough teaching candidates. A national campaign to rally supporters of public education kicked off in Dearborn this week, a location chosen by organizers to draw attention to the damage caused in Michigan by the destructive policies of Education Secretary Betsy DeVos. The highlight of Tuesday’s event at Edsel Ford High School were plans to coordinate a nationwide day of action on May 1, expected to attract more than 100,000 people at more than 2,000 schools in 200 cities across the U.S. 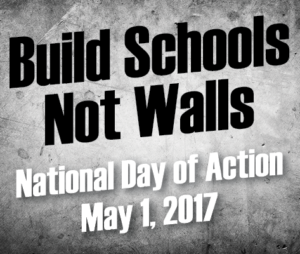 The national campaign calling for investment in public education – “Build Schools, Not Walls” – is being jointly coordinated by the Alliance to Reclaim Our Schools, a coalition that includes NEA and AFT in addition to other parent and education groups.